Maybe I'm biased (being the Red that I am) but fact is, I didn't really like Manchester. Looking out the grit-stained windows of our north-west bound train as we traversed the city, Oi Len and I fancied what we saw not; drab, grey buildings and red brick godowns consumed by brownish-green moss. Even her modern buildings looked cold and architecturally overcooked. The city just seemed... well, tired. I asked myself how words like "dramatic, unique, vibrant, colourful" could justifiably be used in some travel literature to describe this city. We'd just landed at Ringway International from Kuala Lumpur a few hours prior, and Manchester certainly failed to give us the best of first impressions of ole England. Fortunately we were soon out of the city and before long, our train was zipping past the towns, villages and open country of Lancashire. Now, this is more like the England I had in mind, I told my stereotypical self. I remember the day well; 'twas Wednesday, April 7, 2010. Welcome to north-west England. One of the first cities we passed en route was Bolton. Whilst I wasn't overly impressed by her industrial surrounds, I have to say the Reebok Stadium looked absolutely magnificent from our vantage point on the train. That was my first glimpse of an English football stadium - stadiums which, until then, I only saw on TV week in, week out. The further north we went - train and station hopping along the way - the more scenic it became. Factories and industrial plots gradually gave way to quaint villages, rolling hills and open meadows. Our 15-day English escapade was well and truly underway. First stop; the Lake District. It's true what they say; we could immediately tell when our TransPennine Express was nearing Cumbria County. Mounds suddenly became hills and brooks, rivers. 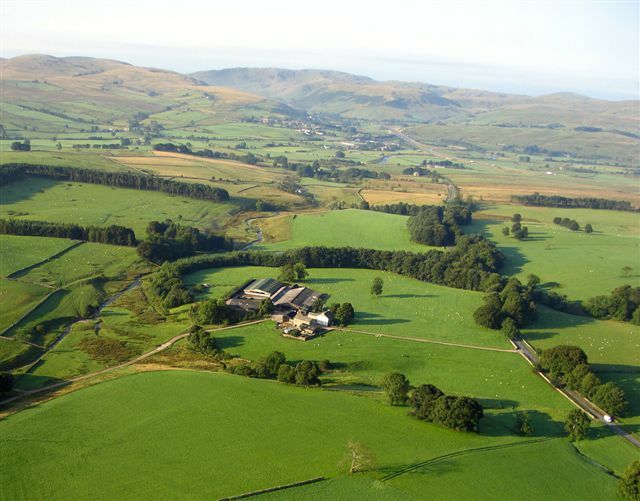 I once read somewhere that Cumbria's greatest asset is her natural environment. I couldn't agree more. 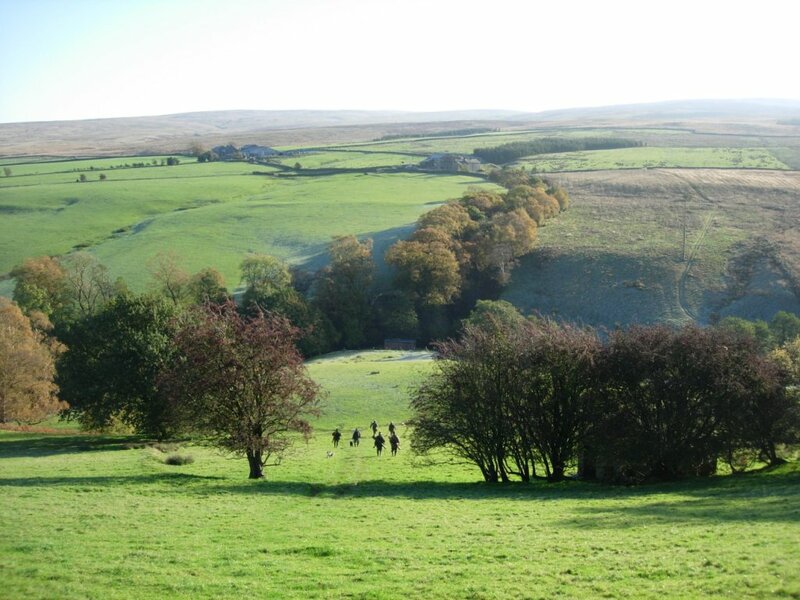 As if Lancashire's countryside wasn't pretty enough, this was even more breathtaking. To describe the scenery here as stunning still wouldn't do the region fair justice. To nature lovers, this was paradise. I mean it. Oi Len and I were well-looking forward to our two-day visit to the area. 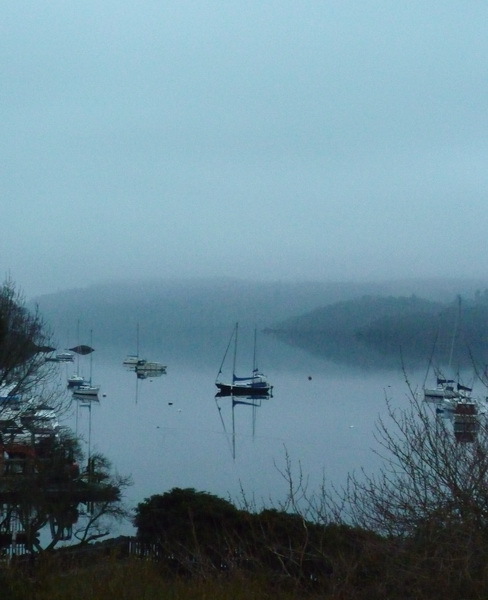 So after thirty-three hours in airports, planes and trains, we finally arrived at Windermere at midday. Oi Len was fine but I was way too paggered to wait for the bus - so we took a taxi to our accommodation instead. "Yer gunna loovit ere; ar proomise", the driver said. He went on (and on) telling us about the deluge and floods the previous November, and how these had wreaked havoc in several Cumbrian towns. "Twas coomin' down yal watter oot theeyer... and aye, me yam got flooded tew. But dun let us flaiten ye, marra. Thi weather's bay (or was it "gay"?) gud at the minute. Fifteen hours o'daylight we get dis time o'year. Always a barrie time ter vizzit dizzis". The good man couldn't stop talking. "Yer lodgin's a loovly ol' buildin", he continued. "Victorian, maind ye. Absolute beaut... and she's rait on thi shore o'the lake - where the je'ty fer thi laike croozis. Greeit views ter be 'ad yonder theeyer. Woon be long now...."
A dozen or so corners later, our hostel came into view. Oi Len and I were awe-struck. 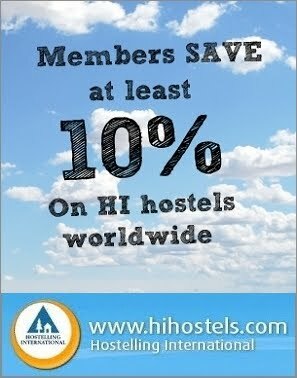 We've stayed in a good few hostels around the world but this was like no other. This hostel was very big, very English and veeeery nice. The best bit is that no more than 30 yards from her doorstep lies Lake Windermere - the famed and fabled lake I've longed to visit since I was in my teens. We fell in love with the place and her surrounds straight away. 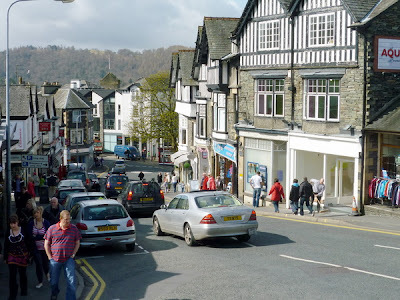 Two hours and a catnap later, we were ready to begin our excursion of the village of Ambleside - but not before dropping by the quaint li'l souvenir shop next door for "English Lakes" ice-cream. That was when we heard someone holler something which we couldn't quite make out. Puzzled yet curious at the same time, we heard it again; "Won maayl-l-l-l..... ter-da-villich!" (the "l" in the second syllable was very accentuated and the last four blurted in rapid succession). It came from a gentleman standing beside this most quaint of vehicles. 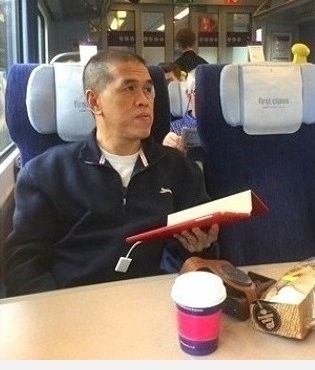 "I think he said 'one mile to the village' ", I recall saying to Oi Len. 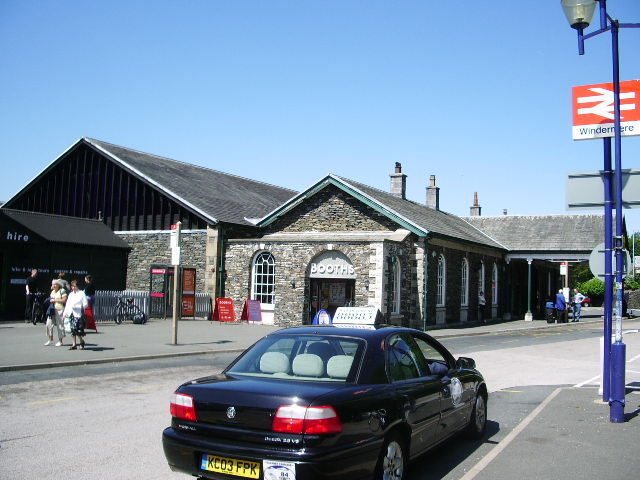 I soon learnt that the vehicle actually served as a taxi - an electric-powered one - between Ambleside Pier on the northern shore of Lake Windermere and the village proper. "We'll walk the mile back from the village later", I told Oi Len. "Let's just enjoy the ride there". 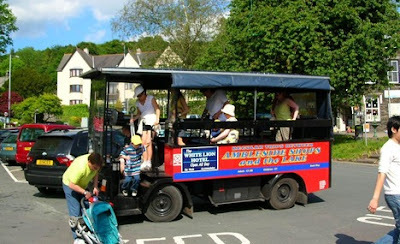 The 10-minute leisurely ride cost us a quid sixty each - totally worth the novelty. 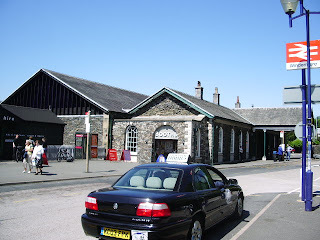 The taxi stopped in front of the White Lion Hotel in Ambleside which happened to be a stone's throw from the first entry on my itinerary, Edinburgh Woollen Mill, where I got myself a fleece jacket; warm, comfortable and British! At £20 after discount (spring sale was on), it was a steal really. Hungry by now, we headed to The Apple Pie Bakery & Cafe for tea and to try out their famous apple pie. It was fab! 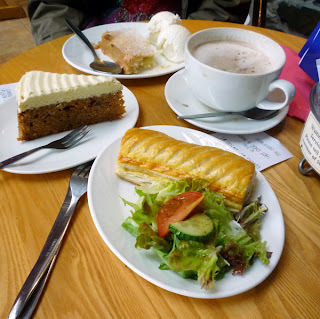 Served piping hot, the pastry was perfect and the apple filling generous. The place was warm and inviting, the service excellent, the grub superb and the prices fair. What more could one ask for? Tea at Ambleside; sausage roll, carrot cake, apple pie and hot chocolate... nom nom! 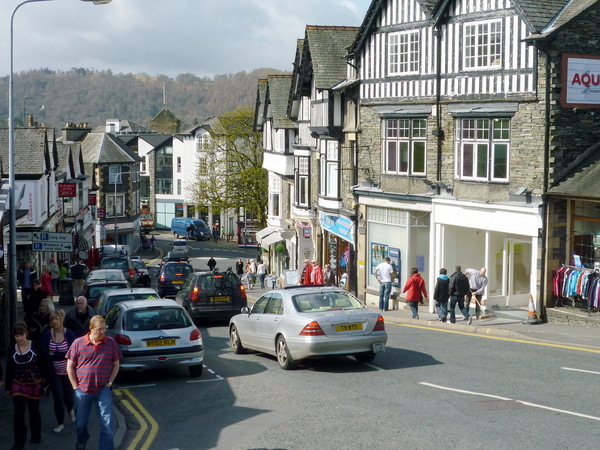 Ambleside is one of those places where visitors can easily find good food, excellent wines and even better ale. The only difference is that, in this particular village, these complement perfectly her glorious lakeside mountain setting. During our two days there, we found her numerous restaurants, bars and pubs packed to the brim with customers... all the time. Shoppers will be glad to know that the village also boasts an amazing variety of shops. Many of these specialise in unique local products such as slate ornaments, original and reproduction water colours of the beautiful Lakeland landscape as well as original works by contemporary painters, sculptors and potters. My wife particularly liked these specialty shops. Shops carrying popular brands - especially those of outdoor gear and clothing - also abound here. 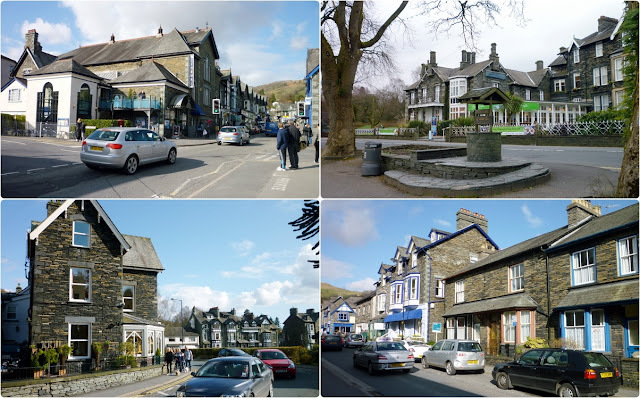 In short, Ambleside has something for everyone, be it food, shopping, adventure or just plain R&R. Oi Len and I spent the next few hours leisurely exploring the village (lots of cobblestone streets and alleyways here) - all the time taking in and enjoying Ambleside's near-carnival atmosphere. This little Cumbrian village is lovely, totally charming and full of character and we were made to feel very welcome by the locals. Her old world charm has been carefully-preserved despite the maddening influx of tourists - especially in the last 30 years. The buildings here - many of them centuries-old - are remarkably well-maintained; we absolutely loved the architecture. One thing I can safely deduce is that the occupants/owners are without doubt very shop- and house-proud people. The missus and I were totally and utterly charmed. You know how it is; time flies when you're having a good time. For those of you who wish to enjoy everything the Lake District has to offer, take heed; two days - or even four - wouldn't be enough. 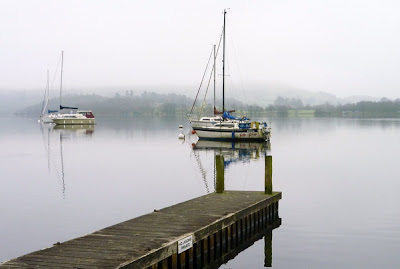 During our 43 hours or so there, Oi Len and I only managed to see Ambleside and take the leisurely cruise on Lake Windermere to visit Bowness-on-Windermere - another quaint, charming village on the lake's eastern flank. 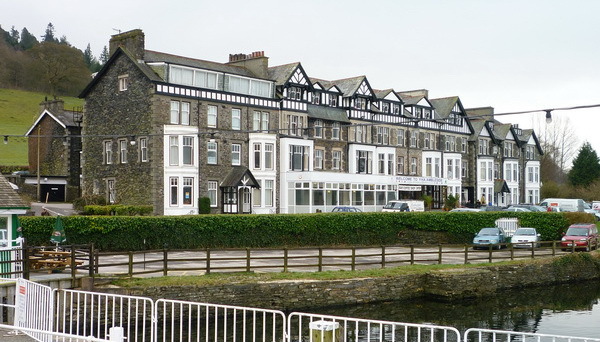 It's a shame we didn't have the time to visit the other towns such as Keswick, Kendal and Grasmere, but I'm confident it's only a matter of time before we do - only this time, we're going to stay longer and enjoy the Lake District to the max. After all, rushing through this region simply wouldn't do her justice as she has so much to offer visitors. Next time, we'll take our sweet time to enjoy the local fare and see the sights - and while we're at it, nourish our senses and renew our souls. The Lake District truly is wonderful - magical even. And it's definitely one place where we certainly wouldn't mind walking the won maayl-l-l-l ter-da-villich - whichever one we end up in. Have you visited the Lake District before? If not, did reading this blog post inspire you to want to make that trip? I really enjoy your writing, Vince - great piece. Thank you, Karien, for your kind comments. It truly is lovely up there.